Engaging the Crusades is a series of volumes which offer windows into a newly-emerging field of historical study: the memory and legacy of the crusades. Together these volumes examine the reasons behind the enduring resonance of the crusades and present the memory of crusading in the modern period as a productive, exciting and much needed area of investigation. The Crusades in the Modern World evaluates a broad range of contemporary uses of the crusades and crusading to answer key questions about crusading today and how the crusades are understood. Each chapter demonstrates how perceptions of the crusades are deployed in causes and conflicts which mark the present, exploring the ways in which those perceptions are constructed and received. 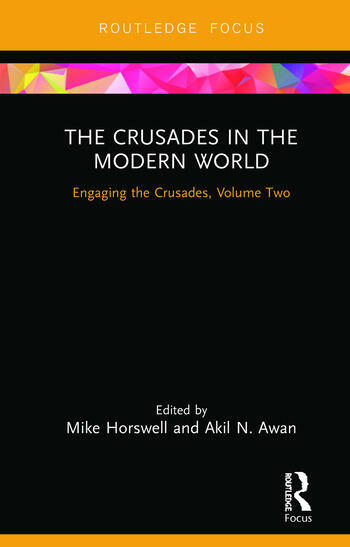 Throughout the book there is a focus on the use of crusading rhetoric and imagery to frame and justify violence, including crusading discourses employed by both Islamic fundamentalists and far-right terrorists, and the related deployment of ‘Reconquista’ rhetoric by populist movements in Europe. The use of the crusades for building national identity is also a recurring theme, while chapters on academic engagement with the crusades and on the ways in which Wikipedia articles on the crusades are created and contested highlight the ongoing production of knowledge about crusading. The Crusades in the Modern World is ideal for scholars of the crusades as well as for military historians and historians of memory. 5) The reception of the crusades in the contemporary Catholic Church: ‘purification of memory’ or medieval nostalgia? Akil Awan is a Senior Lecturer in Modern History, Political Violence and Terrorism at Royal Holloway, University of London. He is Founder and Chair of the Political Science Association’s Specialist Group on Political Violence & Terrorism. His books include Radicalisation and Media: Terrorism and Connectivity in the New Media Ecology and Jihadism Transformed: al-Qaeda and Islamic State’s Global Battle of Ideas. Mike Horswell completed a PhD at Royal Holloway in 2016 and has published his doctoral research as The Rise and Fall of British Crusader Medievalism, c.1825-1945 (2018). He continues to work broadly on the memory and legacy of the crusades in the modern era, from historiography to popular culture.